If they don't hold a special session before the end of the year and approve a new map with 41 of 50 votes, citizens would get to have their say through a referendum. And that could cost as much as $20 million. While there's no official map yet, several aldermen on Wednesday said they're close, albeit not overly satisfied. I'm sure that would make JP Paulus very happy. 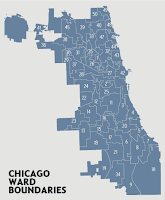 Of course that would only occur if Aldermen still are unable to come to an agreement on a map. Members of the City Council's Latino Caucus today say they will submit their own plan to redraw Chicago's wards Thursday if last-ditch negotiations fail to achieve a compromise agreeable to them and groups of white and African-American aldermen. After weeks of marathon closed-door sessions to realign Chicago's 50 wards in light of 2010 census data that shows Hispanic population gains and white and African-American losses, Latino City Council members and their allies said the time has come to push the effort toward a vote. Several aldermen emerged from a meeting this afternoon to say they had agreed to give Ald. Richard Mell, 33rd -- who is heading up the remap effort -- until 10:30 a.m. Thursday to try to broker a deal. After that, they said they will submit a map to the City Clerk's Office that creates 13 wards with majority Hispanic populations and three other wards with substantial "Latino influence" populations. And they've been working long days and weekends to come to some type of agreement on a new ward map. Some aldermen have worked 12-16 hours a day for the past week, including Saturday and Sunday, trying to draw boundaries for the city's 50 wards. In Chicago, it's familiar ground where race meets politics. "There are no real winners. Everybody has to give," said Ald. Richard Mell, 33rd Ward. If City Council members appeared lethargic Wednesday, they had good reason. Many were up to nearly midnight, hammering out details of a new ward map. "If you really look at the whole map, all 50 wards, nobody is 100% happy with the ward that they're going to get," said Ald. Danny Solis, 25th Ward. Most of us concerned about the ward remap should've been prepared. I don't intend to rehash what brought us to this point, but it's clear that this was bound to be a difficult process thanks to the census numbers. It's easy to point fingers, however, the numbers are what they are. However the map looks and I hope the public will get to see a map from whoever submits one.